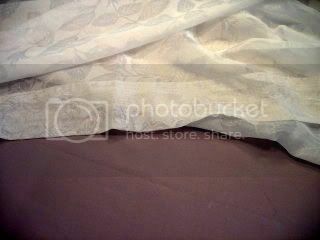 So before the Big Lots craze, I got a set of 12 of the Gibson at LinensNThings, with a coupon of course! Ever hear of them? I didn't...I googled it and it seems they are made in Israel.. 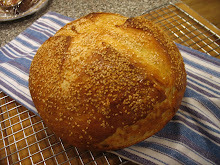 Thin, plain white with a rim.. So what would be my other color...blue, pink...black..red..?? 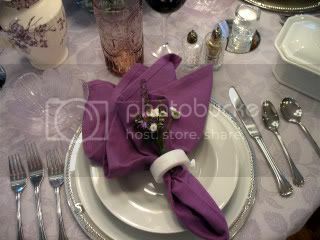 The white plate and soup, silver charger ..Purple stems, lavender goblets.. Pale lavender salad bowl..Christmas Tree Shop.. Individual covered casseroles, Christmas Tree Shop..white candles and tea lights and toile pitcher which was a gift . Oh, I forgot to tell you! 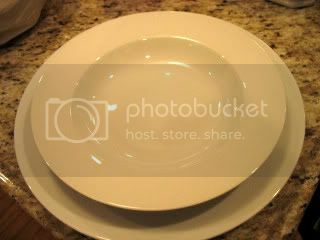 The white dishes and bowls I found at a small market where I get my vegetables..They have a few stores here on LI. 1.25 each! Really! Hard to find a rimmed soup bowl for that. And it was easy to smuggle them in to the house with the groceries! I wanted to get a few more, but I waited too long...I got 8 though, that's good enough.. Thank you for coming to the party! Please visit the other white plus tables...I have seen some of them already and they are beautiful! 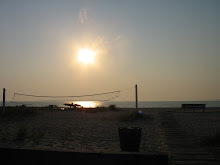 Please leave a comment here, and link back to this post on your blog..Thanks.. 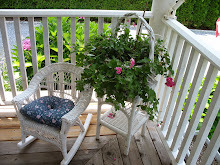 I have replaced Mr. Linky..please use the blog hop . beautiful table!! I hope mine is ok. 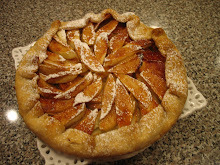 I wanted to use my white covered caserole too...I ran out of room. dish love to ya! Hi, Sweetie...Your white table is just beautiful. You always do everything up just right. I love the dishes so much. The glasses are lovely, too. GREAT job, dear one. I have mine up but haven't found Mr. Linky yet. Where IS that dude? How beautiful the white and lavender look together, Kathleen, especially with the silver chargers. You do have a beautiful eye for detail and bargains. I always love seeing those beautiful white covered soup bowls. This is pretty enough for a bridal shower or even high tea. It is so soft and feminine. You really have assembled a beautiful look here..as usual. I am still working on Mr Linky..the dude is asleep I think! Please follow the links till I get him on! Oh dear stinky linky is up to his old tricks. I hope it gets sorted out. I love the purple and silver with the white. Wonderful! Thank you for hosting this fun event Kathleen!! Kathleen...this is gorgeous! I love where you got your inspiration...you table is just beautiful! Love the candles! Those glasses remind me of the blue ones I found recently...I love the color of yours! Good luck with Mr. Linky. Kathleen, I know it must have been hard to select one colour to go with your white dishes but you picked just the RIGHT one! The lavender colour is so pretty and striking against the white. Just lovely! I was hoping to get to do a 'scape to join in but haven't had a chance. I will enjoy checking out the others that have though! That is such a pretty combination Kathleen ~ pale lavender was a favorite of my moms so this one has special meaning for me. Your attention to detail is perfection, as always ~ it's such a lovely table. Just copy and paste into your address line to come visit. Beautiful table, Kathleen, and I love the lavender! Kathleen, I have to agree, what a lovely shade of lavender you chose to go with your white dishes. Those glasses have such an old fashioned look and are very pretty. I'm laughing at your CTS accessories...I've got a few of those too!! Kathleen, your tablescape color combo is gorgeous! Kathleen-I love your tablescape! Thank you for hosting the party! Here is my contribution Good luck with Mr. Linky! Your table is so lovely! Love the touch of purple! So sorry you are having problems with that pesky Mr Linky, Kathleen! What a lovely table! The touch of purple is just right!!! What wonderful creativity you have...the table is beautiful! 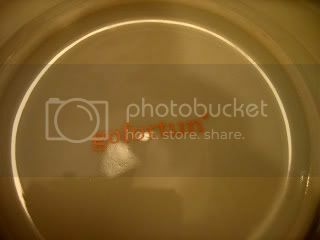 I don't have white or ivory dishes...I've been using my dishes for 27 years...trustworthy Pfaltzgraph. You have inspired me and all the other fantastic "tablescapers". I am Big Lots bound! I emailed Mr. Linky hours ago..no answer..maybe his email isn't working either! Please be sure to visit the tables by following the links, they are all so lovely! Beautiful table. 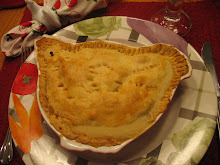 Have you posted the recipe for that tasty looking dish? I'd like to try it. Kathleen, the lavender is such a pretty touch, and what a deal on those dishes. 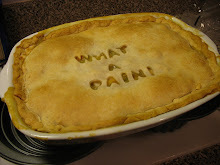 Dinner looks delicious too! How neat to have individual casserole servers. Love the addition of the lavender color. Me, I have no white dishes but I can have fun peaking in at the other tables today between babysitting and potty training (the only white bowl I have looked at all month and still he does not get it). I like the mauve and white!!! This is beautiful! 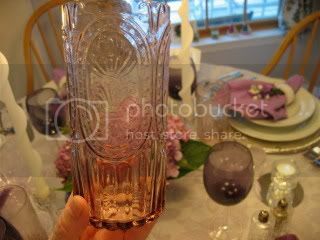 Thanks for inviting us to this fun tablescape party -- I couldn't get the blog hop to work for me (it's me I'm sure) - but I've posted a tablescape too - so, come on over and have a seat at the table. Hey! I did get on -- wonder of wonders! 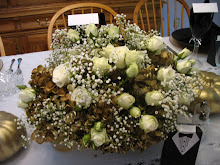 I really enjoy your attention to detail in every tablescape and that you can do it on a budget friendly basis. Gives us all hope that if we take time to look for the bargains we too can do it. I am so jealous of that hydrangea!! 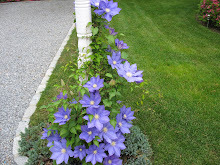 LOVE your color combo Kathleeen...it's just beautiful! I want those glasses you bought @ TJ Maxx...they look so vintage. Thanks for hosting today Kathleen...it was fun & made me step outside my box a bit! I tried and tried to put my link up last night but it wouldn't work for me. I am so dumb at that sort of thing. Anyway, after reading your comment this morning, I clicked on WHITE DISHES and there I was. No wonder it didn't work last night...I was already there and didn't even know it. GOOD GRIEF. This is so much fun. I can see that I am not getting a dern thing done today as I just have to see all the whites floating around. Did I tell ya that I already have a great idea for WHITES NO. 3 ?? HAHA..not putting pressure on ya or anything but we HAVE to keep this fun thing going!! See what you started !!?!! Your tables are exquisite, da'ling! And... lovin' all that purple, so regal! Where should I sit? Just a reminder that the Rooster Party is this Friday, August 28th. I am so glad you joined and I'm really looking forward to seeing your Roosters. Thank you so much for hosting this beautiful "Let There Be Light" Party!!! You're such a dear!!! Your white and lavender table is fabulous...sooooo lovely and soooo romantic! Love all the beautiful white dishes...thank you for letting us know where you got them all! 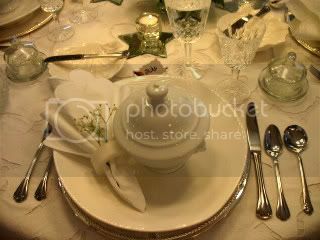 I just adore the covered soup bowls or mini tureens...love those!!! 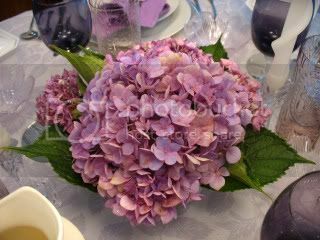 Your centerpiece of lavender hydrangeas is beautiful...love all the details! Like that pretty pitcher with the purple pattern...Ooooh!!! 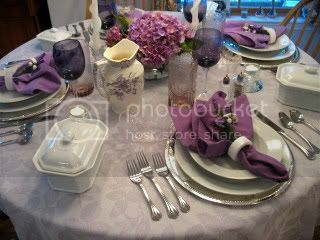 This table really is elegant...I love lavender so this is soooo sweet! Well my friend, I just seen the mention for this "Let There Be White" party a couple of days ago...and I really wanted to participate! I had full intentions of putting a white table together and I'll be darned...if life didn't get in the way...and I just didn't have the time! 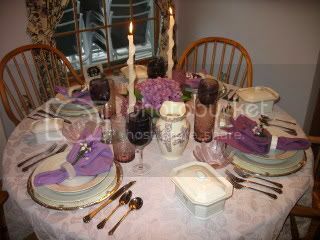 So I reposted a tablescape I did in June...using my new shell dishes...I do hope that is okay? Looking forward to checking out all of the pretty white tablescapes! Thank you again for hosting this fun filled party, my friend!!! Hey Kathleen! Thanks again for hosting ... 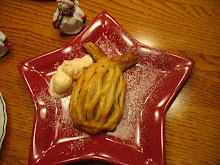 I've read your profile and since you like Jan Karon books ... you should host a "Jan Karon" party! We could try to emulate Cythia's tea party! Lovely table. Love the lavendar!!! Amazingly, I went with all white! That table is ready for some very special guests. It is really elegant and inviting. Your lavendar and white table is so beautiful, Kathleen. 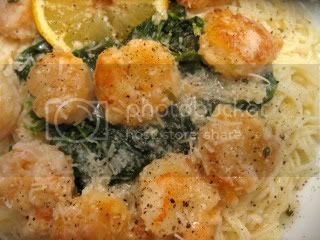 And the shrimp piccata...gotta have some. Kathleen, I went away for a short while to make a sandwich, so I could indulge in your creativity. And it's a good thing I did, because I would've starved to death, considering the time it has taken me just to ogle over all the pictures and close-ups. Weep for me. In any case, I think the colors chosen look very elegant and regal! And I'd trade my soggy little sandwich for that Shrimp Piccata in a second. Btw, it looks like I have mistaken Let There be White, for White Wednesday. Regardless, I still plan to participate, as soon as I get these two events straightened out in my head. WHite dishes is almost all I use. Just wanted to stop back by and say thank you again for hosting this fabulous "Let There Be White" party!!! I had so much fun visiting all the participants and I believe that I visited every one of them and left comments! Each and every tablescape was absolutely beautiful and so inspiring!!! Ahhhh...white!!! Hi Kathleen, thanks for hosting this party. I hope you don't mind that I join in, Laurie told me about it and I thought it might be fun. Your tablescape is just so beautiful and elegant. White makes everything so fresh and the colors around it pop. Lucky you that you have the Christmas Tree Shop. I used to live in De. and loved shopping there. None here in Ga. so far! I love the white and lavender. Great tablesetting, Kathleen! Everything is just perfect! I was pressed for time, but next time I will have food :-) Thank you very much for hosting. Kathleen, it appears your party is a huge success ... Maybe there is a "Let There Be White Part 3" in your future. The lavender and white is so pretty and feminine. And I always enjoys reading your "thought process" as you assemble the tablescape. It's fun reading about your bargains and extraordinary finds. You do have the knack for finding them (or maybe it's perserverance). 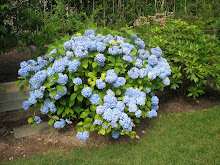 I love the lavender hydrangea; I'm so glad it wasn't "fried". It definitely was a wonderful inspiration piece for your fantastic tablescape. You totally outdid yourself on this one..not everyone has lavender glasses!! 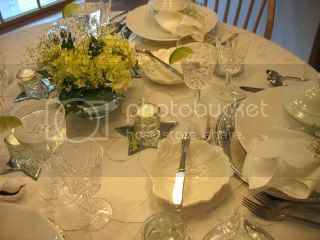 Everything is so beautiful, this tablesetting could be used for so many occasions, from Easter to bridal showers!! I definitely need to go shopping with you for all those great bargains! The shrimp dish is something also I would inhale.. 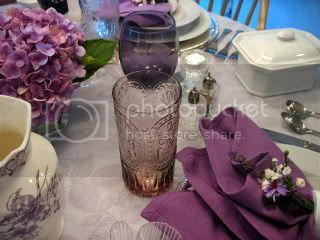 Very pretty table, love all the white, but I especially love those purple glasses. So pretty! 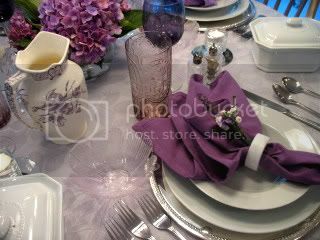 Just love your white and lavender tablesetting!! It all looks so elegant. Great job! Looks like I'm too late to add my link..I finally did my post! 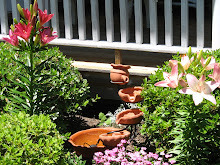 :-) Just pop on over when you get a minute to take a peek. Great post..I LOVE the purple and white, especially the purple glasses and the pitcher. Thanks for being a fabulous hostess Kathleeen! 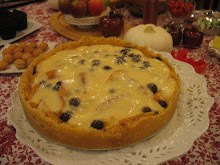 Three or More and Tasty Tuesday~ Got Dishes??? Outdoor Wednesday~ Little Church in the Village..